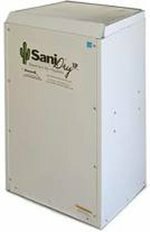 The SaniDry Basement Dehumidifier, or SaniDry XP Dehumidifier, is a large capacity unit optimized for large basements with a total floor area of up to 2,500 sq ft (manufacturer's recommendation). With a maximum water extraction rate of 109 pints per day and the capability to operate at low temperatures this appliance is entirely suitable for the heavy duty task of keeping a large basement free from moisture damage. This dehumidifier is supplied exclusively by Basement Systems a company which specialises in Basement finishing, repair and protection. SaniDry dehumidifiers are manufactured on behalf of Basement Systems by Therma-Stor who sell similar machines under their own well known "Santa Fe" brand. The SaniDry XP is very similar in appearance and performance to the Santa Fe Classic and can be assumed to be, in effect, the same machine. The Santa Fe Classic retails at well over $1,000 dollars and the SaniDry basement dehumidifier is presumably in the same price range. It is not possible to give more definite information as SaniDry dehumidifiers are installed exclusively by Basement Systems and their licensed contractors. Prices are available to prospective purchasers on application to any one of these contactors and will include the costs of installation in addition to the cost of the unit itself. Like the Santa Fe Classic this dehumidifier can be used as a free-standing unit and if that is what is required it would be advisable to compare prices between the two machines with care as installation should be a relatively minor operation. Even with a ducted installation some of you will be capable of undertaking the work yourselves and even if this is not suitable a second quotation for installation of a Santa Fe unit by another HVAC specialist would provide a better benchmark for establishing value for money. Very few dehumidifier reviews of this appliance have been published but as it is effectively the same machine as The Santa Fe Classic Dehumidifier we have no hesitation in recommending it to our visitors for its qualities as a dehumidifier. We cannot comment on value for money due to the different conditions under which it is supplied. The SaniDry basement dehumidifier is designed for low temperature operation and incorporates auto-defrost for this purpose. Without this feature any dehumidifier using refrigeration coils to condense water vapour from the air begins to lose efficiency below 65°F as ice forms on the coils. A defrost feature counters this effect allowing the dehumidifier to operate effectively at much cooler temperatures, in this case down to 40°F. This dehumidifier benefits from Therma-Stor's design and construction and may be expected to perform much better than a room dehumidifier in the cool conditions of many basements. The SaniDry basement dehumidifier is Energy Star rated and with an energy efficiency of 2.9 litres per kilowatt hour is considerably more efficient than a room dehumidifier. The lower energy costs over the life-time of the unit will offset the higher initial purchase cost to a degree. The SaniDry basement dehumidifier does not have a bucket to empty because it is equipped solely for continuous drainage. The dehumidifier discharges water by means of a gravity feed and a pipe run from the dehumidifier to a nearby floor drain. If the only suitable water outlet is at the level above the basement a separate condensate pump will be needed to force the water vertically to that level. The XP also includes an adjustable humidistat which enables your preferred level of relative humidity to be set anywhere in a range of 26% to 90% RH. A level of between 45 and 50% will probably be suitable for most people and will also ensure protection from moisture damage. Once the required level of relative humidity has been achieved, which may take a day or two, the unit will simply cycle on and off to maintain that level, a further energy saving. The SaniDry basement dehumidifier may be used to dehumidify separate room by attaching the unit to suitable ducting and in the event of a power outage the machine stores all the data you have programmed and will restart at its previous settings once the power supply is restored. Dehumidifier reviews for this unit by consumers are scarce but in view of the positive reviews published for the Santa Fe Classic it may be assumed that this dehumidifier is as effective and popular with users. Users of the Santa Fe Classic Dehumidifier report that it is very effective in basements, energy efficient, well built and reliable. There are very few negative comments. The technical merits of this dehumidifier are not in question. It is a high quality unit ideal for use in a basmement and will undoubtedly give good service. This type of dehumidifier is much more expensive than a room dehumidifier but may be expected to last longer, be more energy efficient and more effective, especially in cooler basements. These long term benefits must be weighed against the initial purchase price. We cannot comment on the experiences users of this dehumidifier may have had with Basement Systems or its licensed contractors. We have insufficient information and any such comment would be beyond the scope and purpose of this site. If you have experiences that you wish to share with other visitors we will be happy to publish them here.